The Pro Ink Attachment (PIA) makes possible everything from basic Braille and print text to complex printed tactile graphics. Combining the ViewPlus� Pro Embosser with HP InkJet brings together the most advanced embossing technology and unparalleled HP printing. The fast, robust ViewPlus� Pro Embosser coupled with PIA creates the first real solution for volume Braille and ink production. 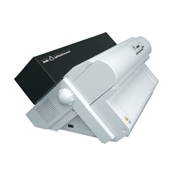 Save paper in production with the only embossing printer capable of double-sided Braille and ink. 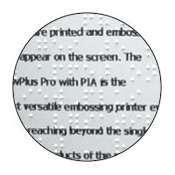 PIA with Pro is also the only embossing system that prints your original text along with the Braille. Text is not back-translated as with others that are prone to mistakes. You can even edit your print and Braille independently. Use your choice of font type or character size. No longer are you limited to using only specialty embosser software. For the first time you can get print with Braille and tactile graphics directly from Windows programs, utilizing the same software you do with your ink printer. Charts, tables, and images are printed and embossed just as they appear on the screen. The ViewPlus Pro with PIA is the most versatile embossing printer ever built - reaching beyond the single-side, text-only products of the past.